Igor had lived at a drug company laboratory before being sent to the New York lab where he resided for 21 years. 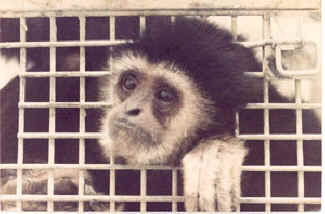 In early 1987, IPPL received a phone call from the veterinarian at the New York laboratory that had sent us Helen, Peppy, Penny, and Blackie, asking us if we would accept an elderly gibbon who needed special care. His name was Igor. He had lived at a drug company laboratory before being sent to the New York lab where he resided for 21 years. At some time in his life Igor had developed a neurotic habit that nearly caused his death on several occasions. He "self-mutilated" whenever he saw another gibbon. Igor would become frantic and bite himself savagely for minutes on end. More than once, he almost died of blood loss. Nobody could tell us the origin of this habit. Sadly, it led to this intelligent animal being kept alone for years in a cage covered by black Plexiglas so that he couldn't see other gibbons. 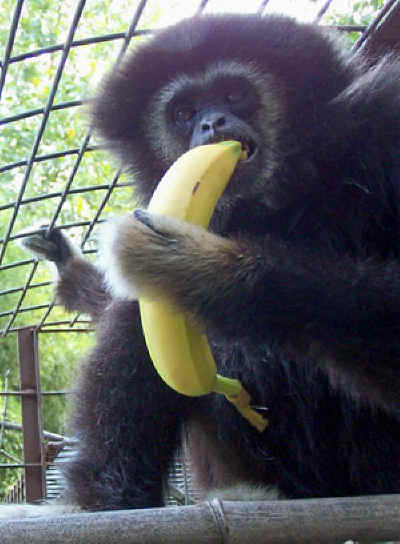 We had to build housing for Igor away from the main gibbon compound, out of sight of other gibbons. We asked our members for help. Compassionate people responded generously. Within weeks Igor was out of the lab forever and installed in his new home. Despite this sad past, Igor really likes people. He loves to have his back scratched. He enjoys bird-watching and even has his own TV. He also enjoys the company of dogs. He has now been at the sanctuary for 22 years. Igor even has his own volunteer friend, Kim, and he loves her visits.